Mike Minor (SP) TEX - When Mike Minor took the mound Sunday, it was his first MLB start since 2014, and he was coming off an extremely successful stint as an all-purpose bullpen lefty for KC last season. Most guys add a tick or two to their FB when they head to the pen, but Minor added almost 4, posted the best GB rate of his career, furthered the use and effectiveness of his slider, and was generally very, very good. The conversion is a huge risk, but after some initial skepticism I'm warming to the idea. Fast forward to today's start, and he draws one of the toughest assignments in baseball right now: the Astros in a hitters park against a lefty. On the whole I thought Minor was decent. I can't watch every pitch of every game, but Minor's start is one that I'd really like to see more of. It looked like he regressed to having some of the same control and flyball issues that he's had in the past while starting, and he was only able to make it through 4 2/3 innings due in part to that. Still, he managed 12 swinging strikes in 93 pitches, and he held Houston to 2 runs, 3 hits, and 2 walks with 5 K's. All in all, at least moderately successful. He gets another RH-heavy team coming in this weekend in Toronto, but they're certainly not quite on Houston's level. From my first few looks at Minor this year, I think it's possible that he's going to have standard mixed-league value, and I'd certainly be willing to take a flyer on him in deeper formats already. Nick Castellanos (3B) DET - Castellanos (one of the other few solid players left in DET) had a nice opening series in Pittsburgh, going 5-13 with a 2B, 3B, and 3 BB. It seems like he's been around for quite a while, but he's still just 26 and hit .303 with 22 HR from June 1 on last season (105 G) with a significantly improved contact rate. If you can do it for 2/3 of a season you can do it for a full season, to paraphrase Bill James, which means that a .300/30/100 season is absolutely a possibility. He could be a very sneaky top-75 player overall.....not bad for a guy selected 14th at his position. The only downside, much like Miggy: a shortage of offensive talent around him. Eduardo Escobar (SS) MIN - Escobar came into the year expecting to fill a utility role for the Twins once again, but the lengthy suspension of Jorge Polanco has pressed him into action as the primary SS for at least the first half of the season. Escobar was a changed hitter last year from the first five years of his MLB career, hitting the ball harder and in the air much more than ever before. That did result in better power numbers, a lower AVG, and more K's than he'd shown previously, but there's reason to expect the AVG to bounce back some, as the hard contact rate was up significantly with a solid LD rate, but the BABIP remained under .300. I'd expect an increase at least into the .260-270 range with the AVG and continued power in the average range. Mix in the decent offense that the Twins have put together, and you have a solid citizen at the SS position that is going to play much more than anticipated at least into July, so he makes for a player that will be undervalued now while potentially becoming some reasonably attractive trade bait around the ASB. I absolutely think he should be owned in all formats and started in most, and yes, I'd definitely consider dangling him by about June, as playing time will become a bit less certain for him once Polanco returns. Sonny Gray (SP) NYY - Gray had a very inconsistent 2018 opener on Sunday, allowing 10 baserunners but just 1 run over 4 innings of work, striking out 8 with 15 swinging strikes on just 89 pitches. Tons of groundballs and tons of swinging strikes would seem to bode well for the 28 year old, but the control issues persist and keep him from more than a mid-rotation ceiling. I do think that with the Yankee offense and his seemingly improved stuff (swinging strike rate has shown significant improvement since 2016) he should be able to provide #3 SP value even without any control improvement, but if some were to arrive he might vault into top-20 consideration. 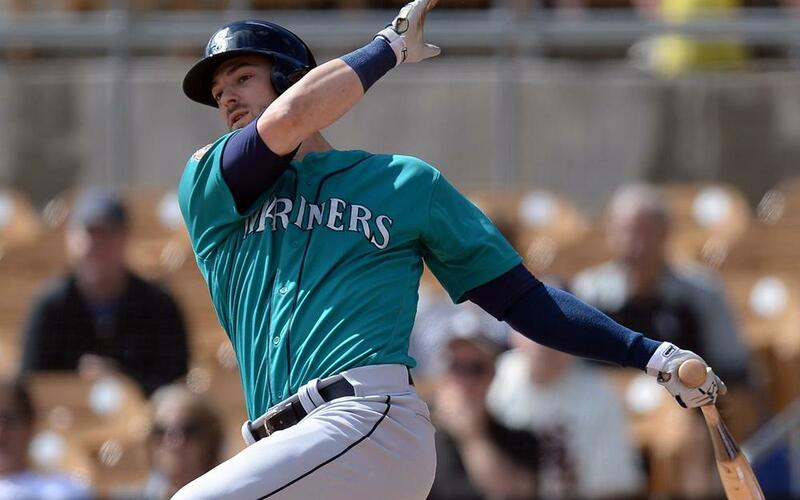 Mitch Haniger (OF) SEA - Haniger has gotten off to a blazing start again this year, going 5-8 with a double, two homers, and two walks in the first series against Cleveland. He seems to be under the radar a bit this year after an injury-riddled campaign in 2017, but the 27 year old looks like a solid contributor to me....a potential 25/10 guy that makes much better contact than you think, and is batting cleanup in a decent lineup. I think he should easily be a top-50 OF if he stays healthy, and he certainly should be owned in all formats.